Michael McCrudden pictured taking part in training with Derry City at Brandywell on Thursday. The talented 27 year-old forward, who is contracted with Institute until the end of the Irish League season, has signed an 18 month pre-contract with the Candy Stripes but wants to get his City career up and running as soon as possible. With the SSE Airtricity League transfer window opened until February 22nd next there’s still time for Derry, as the receiving league, to thrash through a deal for the player. The Gobnascale man has claimed he’s ‘finished with Institute’ and expressed his wish to train with Derry until he officially becomes a Candy Stripe player in the summer. In fact he's already been taking part in training sessions with the Candy Stripes. However, Institute Chairman, Mr Bill Anderson has made it clear that, unless Derry City were to match their valuation of the player and increase their original bid then they expect McCrudden to fulfil his contractual obligations. “We asked him to stay until the end of the season,” explained Mr Anderson. “He suggested he wanted to go. And because I’m concerned about the lad and he was in a bit of a quandary, we went and spoke to Derry City but, to be honest, what they were offering was way below the Coleraine offer. We decided, for us as a club, Michael was too crucial a player and we wanted him to stay until the end of the season and that’s still the situation we’re in now. McCrudden pictured with former City skipper, Barry Molloy during his last spell at Derry City in 2010. It’s unclear whether the situation will be resolved before the transfer deadline but McCrudden is desperate to establish himself as a Derry City player following a previous spell at the club which didn’t go to plan. 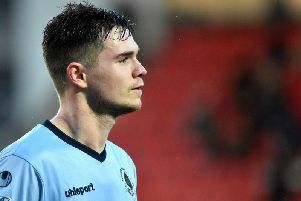 The ex-Newcastle United youth, who played just 13 games for the Candy Stripes under Stephen Kenny, sees the move to the Brandywell club as a ‘second chance’ as he looks to take his career onto the next level. 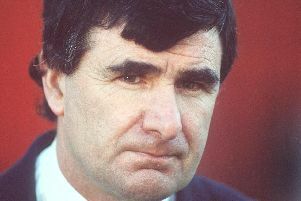 Signed by Kenny as a teenager in 2010 following his release from the Magpies, McCrudden made his debut as a substitute in a 2-1 win over Shelbourne at Tolka Park but failed to establish himself in a team which included fellow strikers Stephen Parkhouse, David McDaid, Patrick McEleney and the late Mark Farren. He left on bad terms with Kenny and the club but feels now is the perfect time to return and make amends. And following an outstanding couple of seasons with Institute, he’s hoping he can build on that form with the aid of Declan Devine and his management team and the full-time ethos at Derry City. On his choice not to return to Institute, McCrudden insists he will always remain a fan. “I’ve played the best football of my life at ‘Stute and loved every minute of it. I’ll go to all the games I can on a Saturday and watch them play. I can’t wait to do that. I’ll be able to go as a fan now. McCrudden needs no introduction to the Ryan McBride Brandywell Stadium having lit the ground up with some scintillating performances which earned him two Player of the Month accolades in the Dankse Bank Premiership this season. “I’ve been playing at the Brandywell all season but it’s the full-time aspect I’m looking forward to the most. I’m looking forward to training every day. I love football and love training.